19,000 feet of collector sewers. 12,000 feet of dual 16-inch force mains. 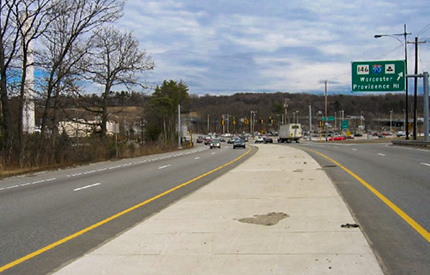 The new sanitary sewer will be supported on the Route 20 bridge over the Blackstone River and Route 146. A new connection to the Upper Blackstone Wastewater Treatment Plant. Reconstruction of the Whitla Drive pump station to handle existing and projected future flows from the Broadmeadow Brook and Grafton Street pump stations as well as additional flows from the Route 20 corridor. 9,000 feet of new 12-inch and 8-inch water main to fill gaps in the existing City’s water system to improve water quality, water system reliability and water access along the Route 20 corridor. The City is committed to working with local businesses and residents to limit the disruption caused during this project. However, due to the nature of the work being done and the constraints of the project area, there will be impacts to traffic and businesses. We appreciate your consideration and patience while we work to complete this project. If you would like additional information or have any concerns that you would like to share, please call the Department of Public Works & Parks Customer Service Center at 508-929-1300.